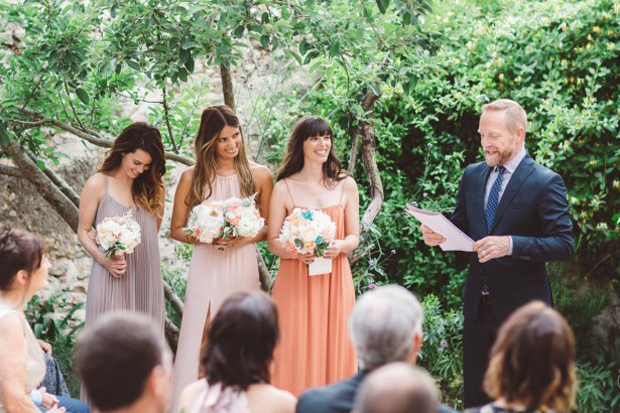 16 of Your Most Popular Wedding Ceremony Questions – Answered! I am a Barcelona based English speaking (but also multilingual) wedding celebrant providing personalised symbolic wedding ceremonies for couples of every distinction from all over the world. Who does your service most appeal to? What can couples expect if they book you – can I write my own vows, get married outside, personalise the ceremony? Yes, I urge couples to write their own vows – simple and heartfelt works best. About 95% of the ceremonies conducted by The Wedding Man are outside in some idyllic (sunny) rustic setting near the Mediterranean. I know, it sounds terrible. All the Wedding Man ceremonies are personalised by gleaning information from the lovely couple regarding their romantic journey from first meeting to their big day. In addition, some couples opt for variations on alternative ceremonial elements like candle lighting, handfasting, sand mixing, tree planting or nailing love letters in a wine box. Have you any other tips couples may find useful? Unless they are very brave and extremely organised I would advise using a wedding planner (at least for the latter stages in the run-up to the big day) if a couple are planning a dream destination wedding in the Mediterranean from thousands of miles away. If they do go it alone, make sure to delegate tasks to friends or family in the days immediately before the wedding to avoid too much stress. With regards to the ceremony itself, they should give some thought to what sort of ceremony reflects their taste, style and sentiments. Have a bash at writing their own vows. A great option for including friends and family is a reading or two. Finally, give some thought to the music that could serve as the musical bookends to the ceremony. I love to help couples create a ceremony that reflects their own choices and wishes, but their love should always be the main focus. They are free to choose their own poems/readings etc. and write their own vows if they wish – but I can provide all of these if they prefer. As I cannot do the legal section, I work mainly with couples who have no objection to getting the Legals done with the HSE, or couples who may have been married abroad and want a Ceremony for family and friends at home. They are then free to have their Ceremony in a venue of their choice, or outdoors at their favourite spot, on a beach or wherever. As a Celebrant I do not have to work off a list of approved venues. To add that special touch to their Ceremony they can include enhancements like a Sand Ceremony, Ring Warming, Handfasting as well as the Unity Candle. I can also advise on how to do their Registration of Intent. Do your Registration early. Finalise your Ceremony details at least two months before your Big Day so you have one less thing to think about at the end. 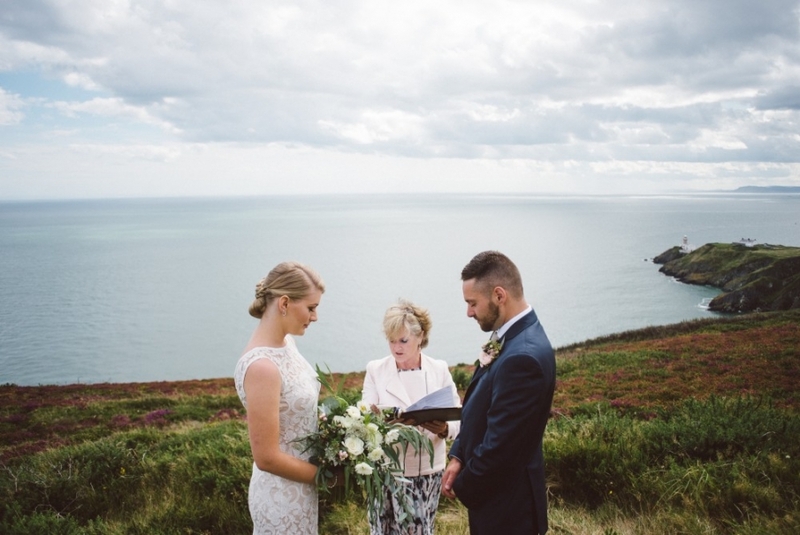 As an Independent Celebrant I offer couples an alternative choice for their wedding ceremony. The legal side is completed separately which means couples then have complete free reign in the choices they make for their ceremony. It is about them and their values and is a celebration of their love story. My service appeals to couples who like to think outside the box and who want a completely independent ceremony. Oftentimes I meet couples who are not themselves religious or traditional but they want to include elements of say a church wedding to please a grandparent or parent. As independent ceremonies do not adhere to any particular belief structure, the ceremony can be whatever the couple wants, religious, secular, traditional, or a combination of all. When a couple books me, they can expect a personal service from start to finish. I meet with couples from the start, we discuss the options they have for their ceremony and together we start creating a celebration that they will cherish. They can personalise the ceremony with readings, music, their own vows, rituals and I offer advice and guidance throughout the whole process. They can have their ceremony wherever they want, as the legals are completed separately there are no restrictions on the location. The current HSE guidelines is that the notification must be given at least 3 months in advance. My advice to couples is do not leave this until the last minute. Unfortunately I have met couples who have left it until the 3 month mark and were unable to get an appointment due to capacity in the HSE. My advice is to give your notification as much in advance as possible. I am a Spiritual Celebrant and a registered solemniser with the HSE which means I can sign the legal documents on the day. 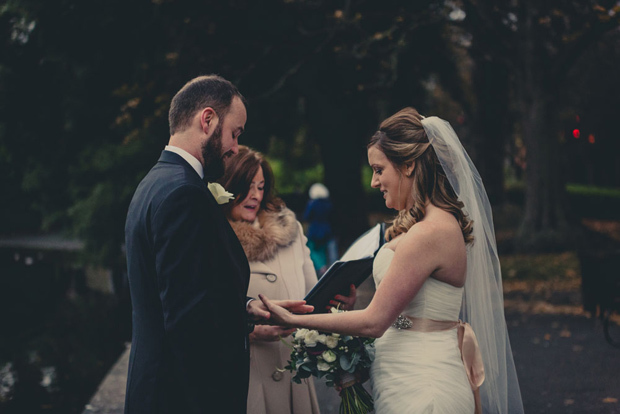 I offer a legally binding, personalised wedding ceremony 7 days a week all over Ireland. My service appeals to couples who want a ceremony all about them. They are not restricted to certain days or times as I can perform a legal ceremony 7 days a week. Couples are free to choose any readings, music, prayers or poems they wish. They can have the ceremony indoors or outdoors once it meets certain guidelines, which I can happily advise on. I will advise on the legal requirements to give notice in the state whether you are living here or planning from abroad. I begin by chatting to every couple to find out what they want in their ceremony as it is all about them as a couple. The ceremony must reflect them. I provide a starter document with some sample readings and vows to help them get started. They are free to write their own vows and make their ceremony as personal as they wish. I will talk them through all the options, so they can make an informed decision of what they want to include. I can advise how to include family members, children and even pets in the ceremony. There are some lovely options including the familiar candle lighting, remembering loved ones, handfasting and even a sand ceremony. 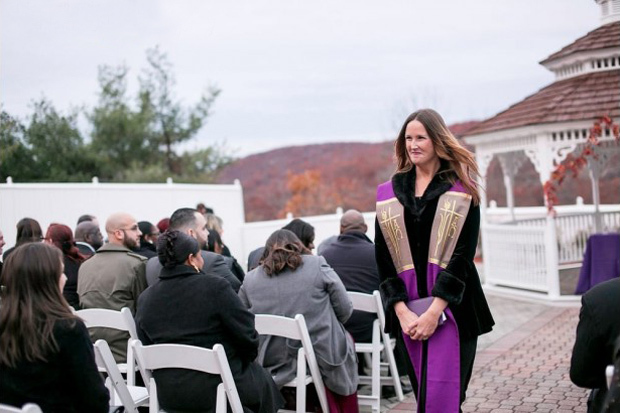 Spiritual Ceremonies are becoming more and more popular as they allow couples celebrate their love in a legal ceremony any day and time of the week. Guests will feel a real sense of “that’s so them” the more input you have in your ceremony. Include songs, readings and people that represent who you are as a couple. You must give a minimum of 3 months notice to the HSE of your intent to marry. Ensure the celebrant you chose is a registered solemniser if you wish to have a legally-binding ceremony so that he or she can sign the legal paperwork on the day. What service do you offer and who does your service most appeal to? Interfaith couples, non-denominational couples, spiritual couples, and couples with no religious affiliation whatsoever are seeking more than the routine HSE in-office civil ceremony. They are turning to Independent Celebrants for that special spice that will add colour and creativity to their wedding ceremony. Celebrants offer symbolic, non-legal ceremonies (sometimes known as hand blessings) whereas Solemnisers offer legal ceremonies (most often in a Registrar’s office weekdays or at an HSE approved venue). These ceremonies are typically generic with names inserted. If you would like an outdoor wedding, in a ring of fairy trees, on a floating dock or in a hot air balloon… there are no limits to how creative you can get with an Independent Celebrant. I’ve been officiating ceremonies since 2010 and was ordained through Universal Life Church and recently up-skilled through the Spiritual Humanists, both based in America. Having married over 100 couples in the States, I’m well experienced in crafting a unique and personal ceremony that rings with the couples’ love. I specialise in symbolic ceremonies for creative couples. LGBTQIA couples are more than welcome! If you would like a ceremony that will be talked about for years to come, reach out to the Rev! Special rituals are a specialty! Beyond the unity candle ritual, a couple might opt for a sand unity ritual with a musical interlude, mid-ceremony. Other options might be a modified or full handfasting ceremony, weaving the cord of three strands around the couples’ hands clasped in a symbol of infinity. Other cultural adaptations may be included such as Tying the Knot, Jumping the Broom, or Breaking the Glass. As I’m fluent in French and Spanish, you may choose to have a bilingual or trilingual ceremony! Destination weddings and multicultural marriages are also available. Would you like to include your children? Beyond flower girl and page boy, you may choose to have your children included in the unity candle or sand rituals. Also, your creative ceremony may have readings from world literature, poetry or simply your favorite song lyrics, spoken or sung by a family member or friend. I’m also well able to coordinate with other suppliers on the day, so that your processional flows nicely into your ceremony introduction. A musical interlude for your Personal Vows is always a nice touch. With an Independent Celebrant, you are not confined to liturgical hymns. You may process in and dance out to the music of your choosing. So let’s get creative! I am an independent wedding and family celebrant, and I specialise in personal wedding, baby-naming and vow renewal ceremonies. Those who wish to have a unique ceremony, written specially for them and delivered any time or place they wish! What can couples expect if they book you – can I write my own vows, get married outside, personalise the ceremony with alternatives to a candle lighting ceremony? I am committed to creating and delivering a warm, personal ceremony that reflects the couple’s lives and relationship. I can supply samples and offer help with readings and vows if needed. Your ceremony can include choices from many beautiful enhancements such as unity candle, hand-fasting and sand ceremony for example. You have complete freedom of choice when it comes to venue and content – for example, a wedding on the beach, inclusion of spiritual or religious references etc. – whatever is important to you. As the law stands at present, as an independent celebrant, I am unable to sign your legal marriage documents. This can be arranged through the HSE before or after your wedding ceremony. The advantage of this is that no restrictions apply (within reason!) when planning your ceremony. We are Independent Celebrants. This means that the ceremonies which we help write, create and carry out – can be of any form or theme. 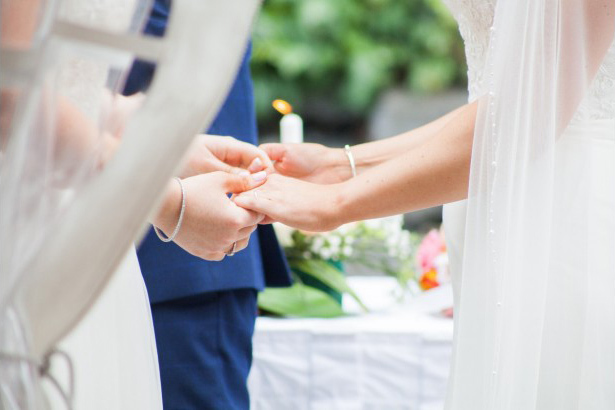 If you are looking for someone to help with a Wedding Ceremony, a Baby Naming, Vow Renewal, Elopement, Commitment Ceremony, Memorial or Funeral – our Independent Celebrants will put together the ceremony based on your way of life, belief or faith. As we are not affiliated with any Government department, Religious body, or other organisation – there is no requirement or obligation to include any particular references or formalities. You have complete freedom! That’s why we’re so popular! With such a diverse and endless range of possibilities to include anything, having our services is a fabulous and very easy way of creating your ceremony exactly how you wish it to be. We pride ourselves on being completely open to everyone no matter who they are, what they believe, where they come from, who they love, what they look like, or how old they are. We have care and respect for all beings! We respect the right of everyone to have their own beliefs and we very much welcome anyone from all beliefs and faiths, or none to come to us to help them celebrate life, love or death. Anyone can enjoy the opportunity to have us create a very personal, memorable and beautiful ceremony. Oh there are just so many options when creating a Wedding, Elopement or Vow Renewal celebration! Inside, outside, at home, in a hotel, a beautiful castle, on a boat, in the forest, a marquee, by the sea… Just yourselves, with your parents, 100 or 500 family and friends… choices, alternatives, decisions and possibilities are all endless!! We have spent the last 10 years building, developing and crafting an extensive collection of resources which couples can utilise for their own ceremony. We have a bountiful array of beautiful Readings – including poems from the likes of Seamus Heaney, WB Yeats and Walt Whitman. Classic and contemporary Readings from authors such as the Dali Lama, James Freeman, Nicholas Gordon, and even Bob Marley. We have Readings about dinosaurs, bicycle riding, marriage being madness, perfect partners, Winnie the Pooh, even Buffy the Vampire Slayer! We have serious, funny, religious, foreign language, short and long readings… You can have a poem, sonnet, prayer, song, story or quote… The choices are endless! 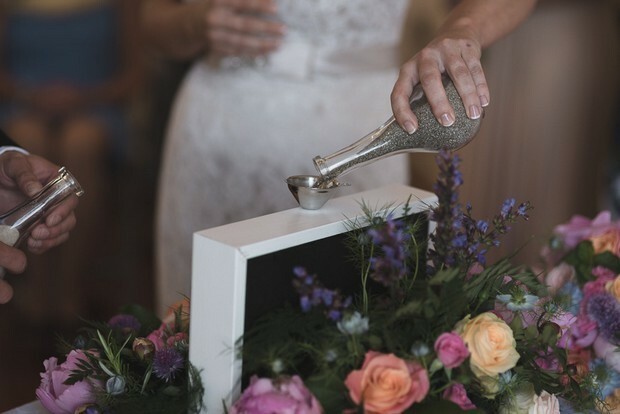 Rituals are quite the same, there is a vast assortment of beautiful elements which symbolise many facets of what marriage and commitment represents to couples in love. 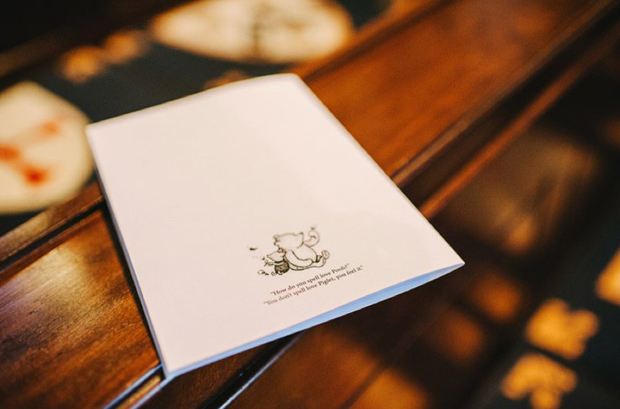 We provide couples with a detailed description of all the most popular rituals – and some which are a little less known, but most definitely still absolutely wonderful additions to any ceremony. We have rituals which are for whole families – some for all the attending guests to get involved – and many more for just the couple. 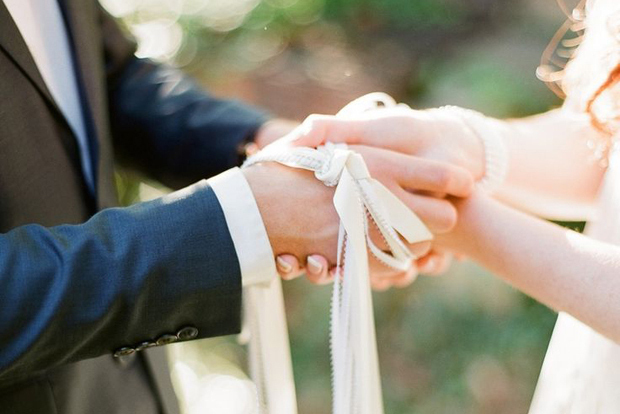 Vows are the most important ingredient for the ceremony. But not everyone thinks that they can write like Shakespeare. So we consult with all of our couples about what they want to accomplish for their own vows. If they feel that they need some help with beautiful examples – we have a fabulous selection from which to choose from. Or, if a couple wish to write some very personal words, we give them assistance and guidance on how to complete their own unique moment. This is the most special moment during their ceremony, so it is important for us to know that you are calm, comfortable and confident in what you are saying to your beloved. YES! We love what we do. Beautiful Ceremonies are our passion. 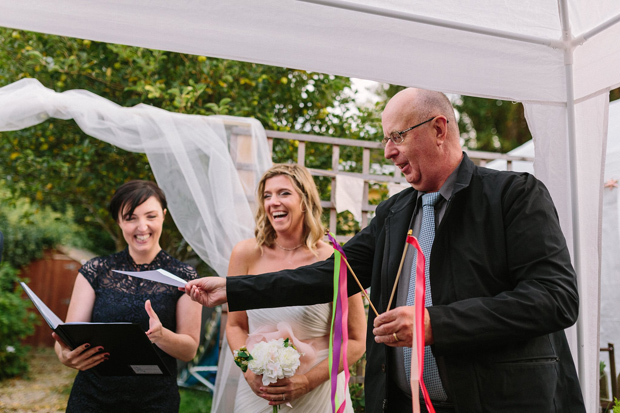 This is why we do what we do – to help couples create their OWN Beautiful Ceremony! So, if you want your own ceremony to be unique, personal, unforgettable, and something that your family and friends will be talking about for years to come – please feel free to get in touch with us. The right person to conduct the ceremony should be someone that has a great personality, a good demeanour, a good public speaker, and takes the job seriously. This person should also display confidence in front of a crowd and be able to do more than just read from a script. 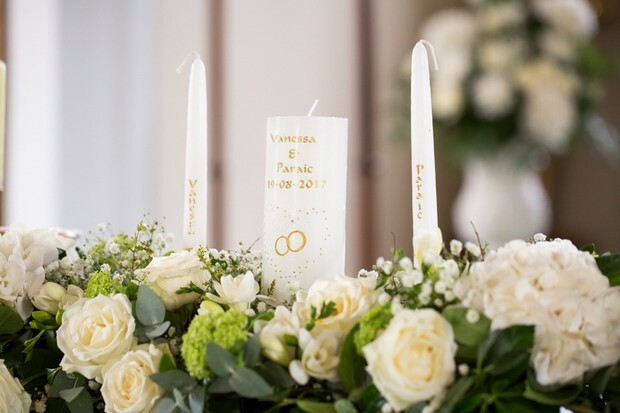 During the ceremony, the celebrant may be called upon to smooth over any unexpected moments; late starts, weather interruptions, lost rings, forgotten candles, even changes to the ceremony mid-way through! Will your celebrant help with these things? We can! We always suggest that we meet or chat – so we can get to know each other, and to make sure that you’re happy with us and what we can do for you both. We’ll listen to all your likes and dislikes, and make suggestions on how we can incorporate all your plans, craft the wedding ceremony, incorporating traditions and rituals, your personalities, your stories, and new trending ideas. That’s a challenging question as not only am I a Celebrant, I am also a Speaker Coach which gives me the advantage of knowing not only how what I say will be heard but also how best to help everyone else who is speaking at a ceremony – and especially if the bride is making a speech, I really want to help her shine! As a humanist too, my focus is on the couple, to make sure that together we create a ceremony which reflects their values, has meaning to everyone attending and is inclusive. Over the years I’ve noticed the majority of my clients are quite open minded and want to create their own wedding rituals. Generally they come through referrals. They tend to be people who respect individual beliefs of family and friends and want a ceremony free of religious practice where the focus is on people. What can couples expect if they book you? Total commitment! As human beings we have a great need and love of rituals and a humanist ceremony gives great freedom to be creative and many couples now want to write their own vows, which I really enjoy. Words matter. What you say and how you say it matters because the marriage ceremony is what I call a ‘Declaration of Commitment’ in front of family and friends. When couples write their own vows, their words are coming from the heart and what mean most to their guests, as well as to themselves. I should mention location as particularly in Ireland if an outside ceremony is planned there are many variables which need consideration. What are the conditions going to be underfoot? What is the proposed seating layout? Is there to be a stage set up, how will the couple be positioned and what are the audio facilities – particularly important!! Depending on what ‘rituals’ are chosen and there are many from the increasingly popular Sand or Handfasting ceremonies which in themselves can be highly personalised, consideration needs to be given as to how these are conducted and importantly ‘seen’ by guests! The more traditional candle lighting can become something quite symbolic and personalised too. In short, the more a celebrant knows about the couple, the more creative and meaningful the chosen rituals can be. Not forgetting of course, there are ways to involve others in most rituals too, particularly when bringing families with children together or perhaps wanting to remember people who are not present on the day. The most important I feel is to choose the celebrant who is right for you, no-one else. A quick phone call will often tell you more about how you might work together than anything else. Emails can check availability, get a price but a relationship begins with a conversation. Then you can move on to develop a plan together. Do take advice and at the same time keep to what you want. It is your day. The commitment of marriage and a wedding ceremony marks the transition from living separate lives to a future together. Keep it simple. Keep it succinct. Keep it special. Above all else, make it yours.